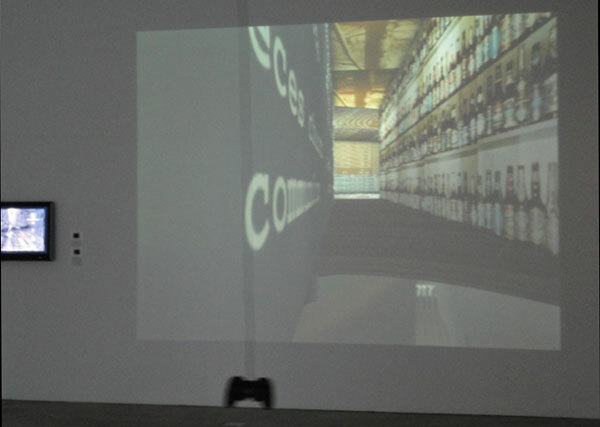 Until this Thursday, an arcade of interactive artistic video games is up at Postmasters Gallery in Chelsea. This mix of lo-fi and hi-res graphics, raw exposed circuit boards and games with clever gotcha moments, was a jolt of quirky joy on a cold Saturday afternoon. 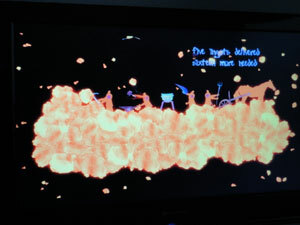 “Swatter” (2011) by Joe McKay is an addictive game of kill the roaches. In the primitive early 1980s monochromatic white line idiom, you are a rapid firing triangle in a field of crudely rendered roaches. You pivot your aim with a wooden knob and hit a green insect swatter on the table to fire. You end up swatting furiously to fire off as many bullets as possible, which becomes inconsiderately loud in the space but deeply pleasing to the suppressed Neanderthal within. “Electric Paint 2.0” is the most steam punk piece in the show. 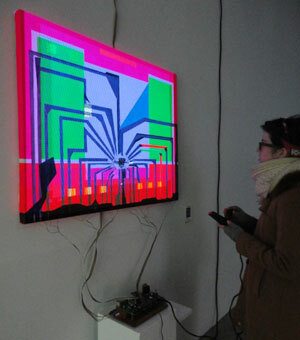 Mike Beradino actually took apart an Atari console and accompanying cartridge and re-assembled and re-wired it into this feedback loop painting, where you can see a vague image of the game on the painting itself. The colors and lines shift in response to the game. It’s a little tough to get the hang of the game interface, so it’s worth asking someone in the gallery for a tutorial. Nevertheless, it’s pretty wild to see this half-painting/half-game melded object. There is now even an iPhone app for finger wrestling. 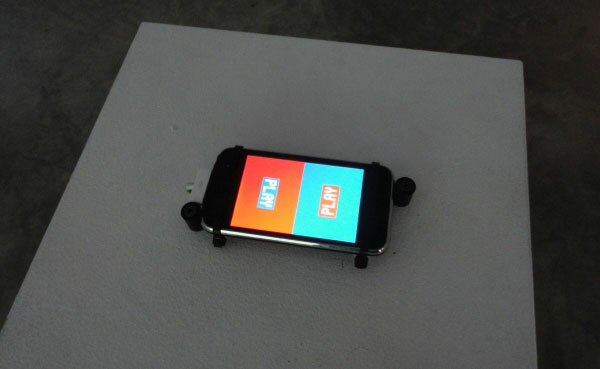 Rafaël Rozendaal’s “Finger Battle” (2011) motivates you to tap the screen as swiftly as possible to prevail over your adversary. It amazing how, despite a tender friendship over many years, a basic phone app turned me and my friend viscously against each another. Eddo Stern’s “Earthling” (2011) casts you as an assembly line of gold miners. Each button on the controller controls a different worker in the production process. And by tapping away on the buttons, you extract, crush, melt, shape it into bar and then ship it off on horseback. The game commands you to produce 20 bars. Although it takes several minutes, the alluring and glowing graphics lead you to anticipate a rewarding cinematic ending once you win. Meanwhile, the miners’ hearts start to visibly palpitate and eventually they die off causing an annoying delay in the production process. Identical replacements soon arrive for you to also use up in the same way. It is chilling how the game motivates you to heartlessly pursue that twenty bar goal despite the frequent deaths of the miners. Spoiler alert: there is no “victory sequence” after reaching twenty bars. The goal text disappears and the mining goes on if you want to play indefinitely. You then realize how naïve you were to think that the workers mightily actually win at some point. With no resolution in sight, you eventually abandon the workers in the mine. Apathy has its rewards. It’s amazing how a “game-theory” motivates us to chase victory. 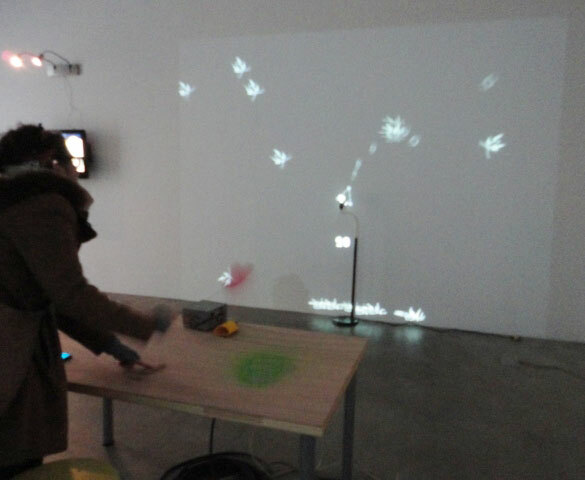 This artistic arcade was enjoyable, fun and totally worth the trip. But what makes it art and not just mere games is how many works revealed how the desire to be winner can twist us. Whether it’s turning against a friend over a dumb finger app, exterminating roaches with as much precision as possible, working miners to death or shooting coping mechanism sledge at traumatic experiences, we open up to some weird and violent ideas if there is a payoff for feeling like a winner. Play Station, curated by Marcin Ramocki and Paul Slocum, will be on view at the Postmasters Gallery (459 West 19th Street, Chelsea, Manhattan) through December 22.